Whitechapel - One in a Million! 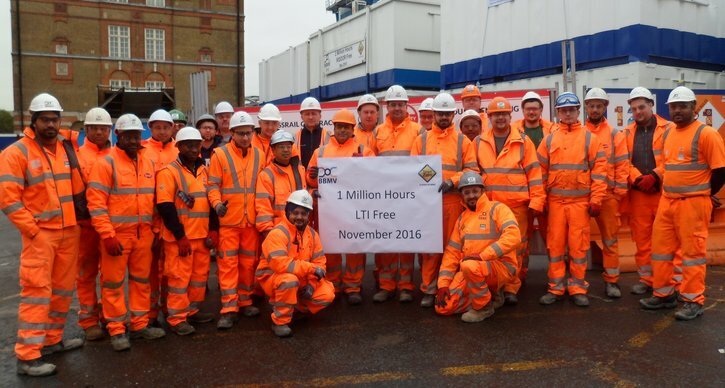 The C512 Whitechapel team reached a significant milestone this November, when they achieved one million hours without a Lost Time Incident (LTI). It means that for over six months, there has not been an accident on site that has caused anyone to lose time through being absent from work. With the amount and type of work ongoing during that period, it is an amazing achievement for the BBMV Joint Venture team that is extremely difficult to beat. Whitechapel are out in front of all of the Crossrail contractors in terms of this measure. Success on this scale and regularity is down to the hard work and conscientious approach that everyone has on site to reporting incidents and looking after each other. Well done to all of the project team!